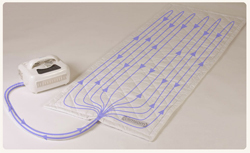 Night sweats, the CLIMSOM mattress topper keeps you cool and calm at night. Night sweats? The CLIMSOM mattress topper keeps you cool and calm at night. For the first time, this innovative product allows you to cool the place where you sleep, the surface of your mattress. Sweating is a natural bodily phenomenon that tries to thermoregulate, or maintain a stable temperature. Sweating is a way for your body to show it is working to cool you down. Bedding: The mattress is often a thermal insulator that cannot get rid of all the heat your body lets off. You then reabsorb your own heat. By offering your body a more comfortable temperature, you don't have to exert the effort that leads to sweating. Your nights are more serene, and you won't wake up in a sweat, having to get changed in the middle of the night. Furthermore, by limiting night sweating and excess heat, your skin breathes better and is also healthier waking up. The vasoconstrictring and anti-inflammatory properties of cold produce clearer, firmer skin. Since my menopause, I sleep very poorly because of my hot flashes. I tested CLIMSOM, and my nights have been peaceful ever since. Before, I would sometimes have to get changed twice a night, drenched in sweat by those cursed hot flashes. Now I adapt the temperature of the mattress pad to my physical temperature, and I finally have restful nights.